Motion picture, and then slow motion, has been immeasureable help in the coaching of sports technique. sies in sport was whether horses galloping had all four hooves off the ground simultaneously. The advent of the high speed photograph settled that. Since then the motion picture, and then slow motion, has been immeasureable help in the coaching of sports technique. There are so many inter-related activities in even the simplest of sports movements that, until now, there has been no other sure way of a complete analysis than this painstaking and time-consuming method. Imagine, as one recent report claimed, 15 engineers in East Germany taking one month to chart one shot put. To be effective the relative speeds of dozens of limb and body segments, the changes in centres of gravity all must be charted by measurement, weight and force, and their interaction one to the other. So coaches can only mould and guess from instinct and experience when correcting the styles of their charges. Until now there has been no eff e c t i v e method as only a computer could cope with the complexities involved. But computers are, in essence, mily machines and rely entirely on the accuracy and the skill of the programmes controlling -their output. A professor, Gideon Ariel, at the newly created School of Exercise Science at the University of Massachusetts, claims to have been able to create an adequate programme. With it he has been able to imp r o v e two world throwing records, add a measured 10 per cent to the speed of an ace baseball pitcher, explode a myth about the "feel" of a tennis ball upon the racquet, improve the rehabilitation of footballers after injuries, add five centimetres to the standing jump of a basketball player and explain why smaller players can shoot a puck Jib ice hockey (aster than taller players. Ariel claims to have spent more than 10,000 man hours in seven years preparing his computer programmes. Even then he would not have been able to achieve his breakthrough without the assistance of massive American technology. Firstly, he was able to plug into the $8,000,000 University of Mass a c h u s e t t a computer through telephone connections and a telel type terminal in his own studyoffice at home. Then he was able to use a device called a digitizer he found at the Dartmouth Medical School, which enabled the movement of human limbs to be fed directly into the computer by means of a sonic pen tracing the movement upon a special screen. Ariel is currently working at the recently established US Olympic training village at Squaw Valley, California. There, with a capital outlay of hundreds of millions of dollars, the US has a camp at which resident experts in sports medicine assist with the preparation of hockey players. soccer players, basketballers. conoeists. swimmers, athletics, and so on for the 1980 Olympics. Originally, back in Israel, Ariel was a discus thrower who represented his country in the 1960 Rome Olympics. throwing, but became so involved in the science of movement he turned his athletic zeal into a drive for knowledge and a Ph.D. in exercise science. His most famous test came In November, 1975 when the US Olympic Committee assembled the 12 best discus throwers in the country for filming with highspeed cameras and then flew the film to Ariel for his recotttmendatioRs. 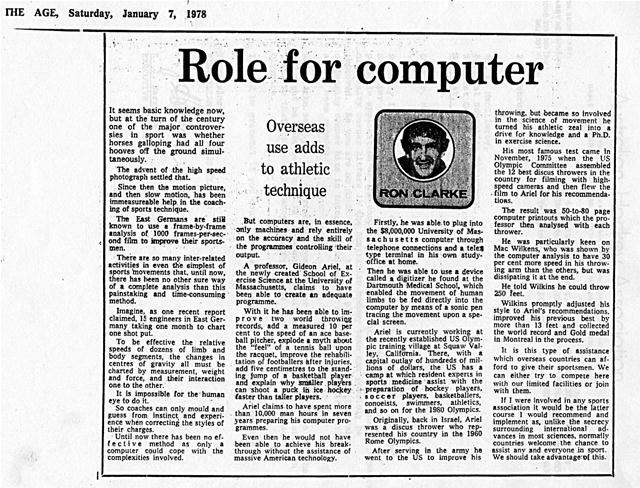 The result was 50-to-80 page computer printouts which the professor then analysed with each thrower. He was particularly keen on Mac Wilkens, who was shown by the computer analysis to have 30 per cent more speed in his throwing arm than the others, but was dissipating it at the end. He told Wilkins he could throw 250 #set. Wilkins promptly adjusted his style to Ariel's recommendations. improved his previous best by more than 13 feet and collected the world record and Gold medal in Montreal in the process. It is this type of assistance which overseas countries can afford to give their sportsmen. We can either try to compete here with our limited facilities or join with them. If I were involved in any sports association it would be the latter course I would recommend and implement as, unlike the secrecy surrounding international advances in most sciences, normally countries welcome the chance to assist anv and everyone in sport. We should take advantage-of this. Generated on 4/22/2019 1:42:28 PM (PST) ADI/HQ/GBA/2019/ARIELCLOUD/v3.0.2018.0126.